Big League Clu breaks down the Final Four and chooses his champion… will you get it right come Monday? After a very exciting (and gut wrenching) weekend of Sweet 16 and Elite 8 matchups, we are now here at New Orleans for the exciting conclusion of the Final Four. The matchups are set, lets see which two teams I think will be playing for the championship on Monday night, and who will probably be hoisting the championship trophy. 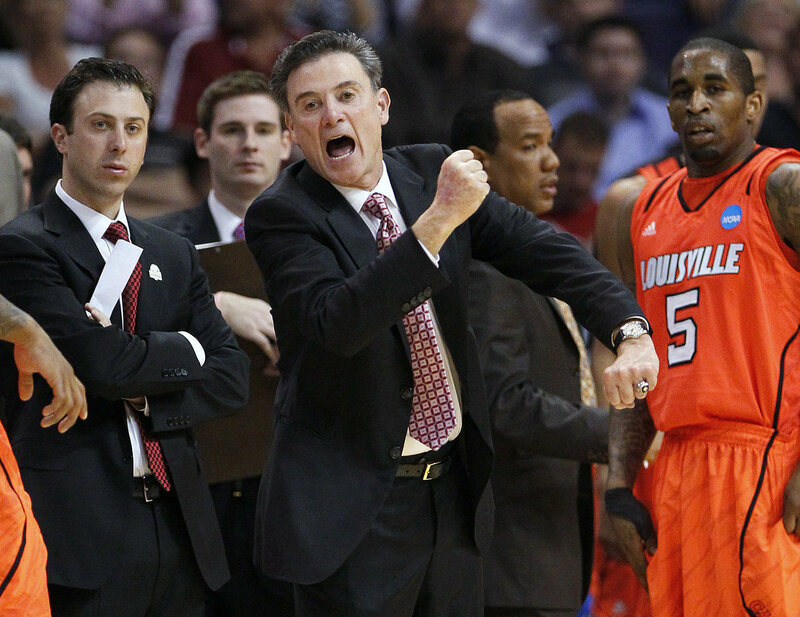 First of all, a battle of top notch head coachs Rick Pitino (Jobu’s favorite! 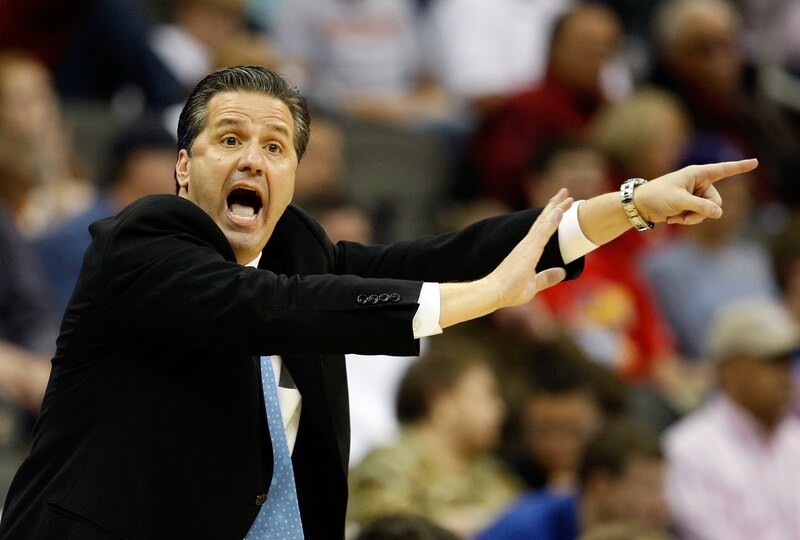 )…who happens to be one of three coaches in the history of the NCAA to take three different programs to the Final Four (Providence, Louisville and… Kentucky! in 1996). He goes up against John Calipari who has also taken three schools to the final four (UMass, Memphis…which was later vacated due to NCAA violations, and of course Kentucky). Secondly, you have an in state rivalry matchup, and Louisville and Kentucky fans HATEEEEEE one another, which should play a huge role in a Final Four matchup. Finally, you have Kentucky, who happens to be a big favorite to win it all this year (keep in mind that the Wildcats have not won a national championship since 1998). Oh the other hand, Louisville really surprised a whole lot of teams in this tournament. They had to beat Michigan State and and red hot Florida team, and they are coming back to the Final Four for the first time since 2005. They have not won a National Championship since 1986. So, regardless of if you dislike both schools, every college basketball fan should definitely tune in to this game, as I feel it’s going to be a doosey! Of course the stage is set for Kentucky to just roll over Louisville. The Wildcats have six players who are averaging over 10 points per game or more, and could easily be starting on any other program in the country! 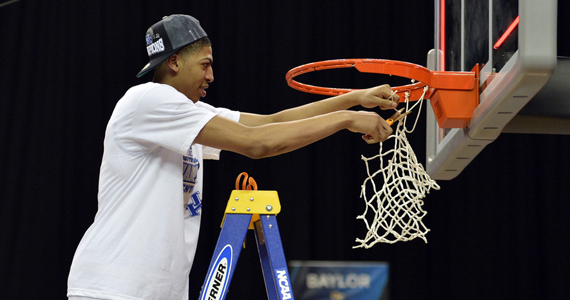 They are led by Freshman Behemoth F Anthony Davis (14.3 ppg, 10.1 rpg, 4.6 blocks per game) this guy is massive! He should easily be playing in the NBA next year. This team is as deep as they are tall and strong. Their only downfall is that they lack experience, because Calipari & Co. are notorious for having one and done (players who come into the program for one season and then jump to the NBA, like John Wall in 2010). The younger generation of Wildcat fans has proudly accepted UK being the face of “One & Done U”. This is largely due to the success that accompanies talent, but equally as important,they have good coaching. Louisville brings a little bit of a different approach, they are led by seniors who have experienced all of the hardships of winning and losing. Louisville is riding an 8 game winning streak that started in the Big East tournament (where they won the title) and has continued into the Final Four. It is much like the run UCONN made last season. The only difference is that this Cardinals team plays as a whole and does not depend solely on one start player to win. The Cardinals can flex their muscles like the Wildcats, but they don’t have the deep bench like Kentucky does, so it will be interesting to see how coaching will play a role in this matchup. Their big men, Center Gorgui Dieng (9.1ppg, 9.0 rpg) and Forward Chane Behanan (9.5ppg, 7.4 rpg), should provide some support down low, but everything will depend on Louisville’s ability to handle the ball, and make tough shots. Kentucky been able to shoot from anywhere on the court all year. So here is what everyone has been waiting for, the winner of the first game: I think this game will come down to the last four minutes. 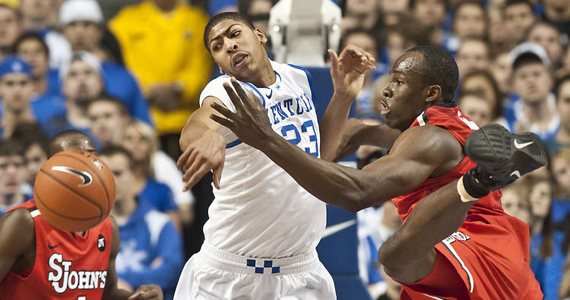 Calipari will be able to use his deep bench, and of course the ability of Anthony Davis, to end this run by Louisville. Kentucky advances to play in the title game. Talk about big men! Both Ohio State and Kansas have lots of size underneath. For the Buckeyes, All-American F Jared Sullinger (17.6ppg, 9.1rpg) looks to the be driving force for Ohio State as they go up against the Jayhawks and their big man, unanimous All-American Thomas Robinson (17.9ppg, 11.8 rpg… sheesh!) The last unanimous pick for All-American was Blake Griffi, and we all know what he’s doing out in LA. This game might come down to a battle of big men, but don’t forget the back courts. For Ohio State, this pesky Guard named Aaron Kraft was seen swatting away balls, getting into peoples faces, and diving into the stands. Along with the DeShaun Thomas and the clutch shooting of Lezelle Smith, Jr., Kraft helped Ohio State knock out the Orange in the Elite 8. Kansas, meanwhile, has another guy capable of KO’ing the Buckeyes in Guard Tyshawn Taylor (16.7ppg, 4.7 apg) who, along with Robinson, is part of one of one of the best “one-two” combinations in all of basketball. Both Ohio State and Kansas seem to be pretty evenly matched. 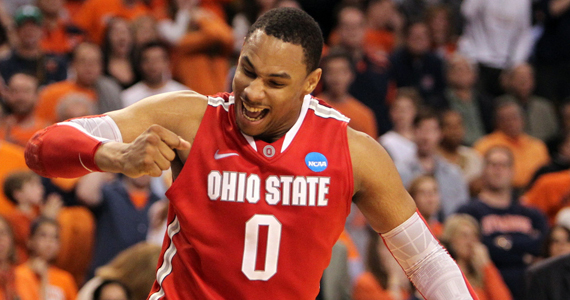 Ohio State boasts some big men underneath, good outside shooting and hard nosed defense. The Jayhawks have one of the best All-Americans in the country at Forward, but outside of Robinson and Taylor, they don’t really have much… Plus, they beat a North Carolina team that was riddled with injuries by the end of the tournament. I have gone back and forth on this, but after watching both Ohio State and Kansas games this past weekend, I think that we will be seeing Ohio State advancing into the finals on Monday night to face off in a rematch of last years Elite 8.
Who Wins the National Championship?? It all comes down to Monday night, Ohio State vs. Kentucky for the National Championship, and in the end, I would have to say that Kentucky will come out on top yet again, because of their stellar team play and future NBA talent. They will bring a National Championship back to Lexington for the first time since 1998.